We appear to have an obsession with collecting nicknacks for our homes, with the result we're always needing more space to show these trinkets off. Even if you're not so inclined, this book offers great ideas for someone you know (if you can't do it yourself) to make up what you need to show off your decorating flair or to just stock stuff. If you're into woodworking, or are a beginner, this book is geared to get you going. Everything from measuring to cutting, power tools to joints, materials to finishing, etc., has been carefully considered. Projects I liked include the Rolling Cart (very handy and practical), the Kitchen Cart (great idea), the Storage Bench, and the Bathroom Cabinet. 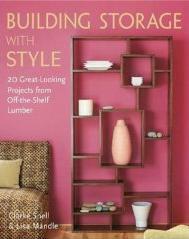 Even if you're not so inclined, you'll get ideas of what to look for when shopping for storage units. Beautifully illustrated. Conclusion - Handy, informative, and useful.